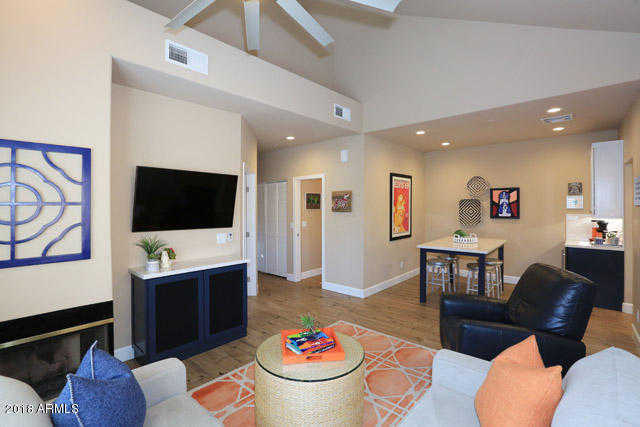 Move-In Ready – Just Bring Your Suitcase – Turn Key Resort Living AwaitsCurrent owners purchased, fully remodeled, and furnished condo summer of 2018 to be their vacation destination. Fast forward 6-months, and they have chosen to call Scottsdale home. Not only is the kitchen completely equipped with top of the line appliances, the built in dry bar includes a wine fridge, and the dining area is complete with a custom table. Living room sectional complements the built in entertainment center. All bedroom furniture is yours as well, including custom closet systems. From silverware to sheets, all you need to bring is your suitcase to start enjoying resort living. HOA fee includes everything from gym, pools, tennis courts, cable television, water, 24-hour guard gate, and more. Approximate size: 85.00 sq. ft. Please, send me more information on this property: MLS# 5859761 – $295,000 – 7710 E Gainey Ranch Road Unit 205, Scottsdale, AZ 85258. I would like to schedule a private showing for this property: MLS# 5859761 – $295,000 – 7710 E Gainey Ranch Road Unit 205, Scottsdale, AZ 85258.